Serpent/CHICCHAN feels its way by the Truth it feels through the Vibrations of Earth. A Serpent Feels the Forces of Earth’s Vibration so well that it knows everything in its path as a Higher or Lower Frequency of Vibration. The Serpent is the symbol of Illumination and the Gift of Seeing Clearly. Through the thoughts of Earth/CABAN, today we can Know our Oneness with the Whole of Creation on Mother Earth. Earth/CABAN offers a Perspective about Movement. It is symbolized by Mother Earth, a body of Divine Movement. Our Mother Earth perpetually moves through her own cycles and seasons, purposefully leaning to and fro to maintain a Balance that guarantees every place on Earth it’s own Season in the Sun. The Earth carries us through the Darkness and always Returns us to the Light. One Season would always be in Balance with another. Everything that Human could ever believe was lost forever, would always come around again. The perpetual Seasons of Earth’s Movement, offer the Truth of the Future and the Past. We could always look back and discover a Season we’ve known before. By this Truth, we would Believe in a New Season that exists in the Future. Earth/CABAN illustrates the Movement that is always Fair, always offering an Equal experience for all kinds of Happiness. Earth/CABAN holds the Truth of everything Human needs to know about the Meaning of Everything. Through her movement, we can know how our Spirit moves with her through every Season and every cycle of Human Transformation. She is always carrying us to our Perfect Time and Place. The Aztec Ollin, resides at the center of the round stone calendar, marking 20 milestones of Human experience, 20 different perspectives of Knowing. The elements of Divine Consciousness are reflected equally from the macro to the micro. To Know all things, begins with Knowing One Thing. We are a Reflection of the Creator. All things are a Reflection of the Creator’s Love. Every small thing holds the same elements as the One Divine Thing. 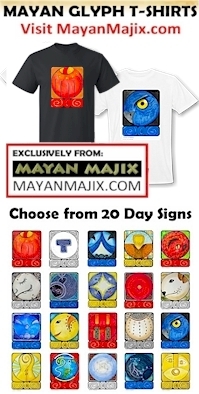 The All-in-One of the Tzolk’in’s 20 Day Signs, reflect everything We Are. We experience the Knowing as Synchronicity. We’re astonished how a calendar could reflect our own thoughts in the Moment. Each Day Sign is an Expression of our Divine Nature. All-in-one, they reflect ALL the thoughts of our Divine Nature. Not a single one of the Day Signs tell us anything we didn’t already Know. The calendar marks the Divine Times and Places we can Know there is a Purpose in all the thoughts we think “Now.” Every Time has a purpose for a Divine thought. The Cherokee, Heron, is a symbol of perpetual migration. Heron moves from one place of Abundance to another. Our Spirit moves from one Divine Perspective to another. One and All will hold a Truth we need to Know. The Heron is a symbol of the Phoenix that rises from the ashes of its past. The Ollin symbolizes Movement by Spirit through Divine Intentions. The Ollin marks a Divine Message, to live by the Truth of our own Divine Thoughts. This is day defined as “lucky” for the “active principle” and “unlucky” for the “passive principle.” It’s a day to seize an opportunity to CHOOSE our direction of Movement ON PURPOSE, for a REASON, instead of just “going along.” A Divine Blessing is offered when we do. Ollin is said to hold the Consciousness to See what we are Becoming. Altar to the Year Bearer 13 Earth/CABAN near Lake Atitlan. 13 Earth/CABAN completed a cycle of Planetary Ascension in 2012. We are 7 years in to the next 13 year cycle. We are guided by the Year Bearer 7 Human/EB, in the Balance for Human’s Divine Justice. 13 Earth/CABAN was the Ascension planned from the beginning. The K’iche Day Sign is N’oj, a symbol of ALL Knowledge and ALL faculties of Knowing. Human was created as One and the Whole of Everything. When we can separate the two sets of Conscious Thoughts – the Human’s thoughts of fear and illusion, from our Spirit’s thoughts that lead us in the direction of Love and Happiness, we hold the Wisdom of Knowing the Power to Create a new Reality. We’ll Know which thoughts are True. The Beauty of Mother Earth can be seen clearly once again. Our Vision is elevated see the Paradise we could create with her Beauty. Mother Earth is the epitome of the Movements of Love. Divine Thoughts of Her will sweep away the illusion of Human limitation. To all my relations, may we celebrate our Ascension of Consciousness. May we imagine a gem we will tuck away as our own secret treasure. May we Pay Forward our Compassionate Love, so we are carried by a Divine Flow. May we see how our Future has already been changed. May we imagine the hybrid Seed the evolves to a more Potent version of itself with every harvest. 13 Earth/CABAN in the last round marked the Anniversary of our first vision of Earth from outer space. 13 Earth/CABAN was the first day we saw the Beauty of Earth as seen by the Universe. We imagined we were there, just too tiny to be seen in the picture. We were given a new Truth of our Time and Place that we would now imagine in a new way. Earth went from a drawing on a piece of paper the a ball of Blue Light, suspended in the Balance. All my Relations, may we look across the Medicine Wheel to the Season of Harvest right across from us. We are the Seed from the Best Fruit of our last Harvest. We are tending the Seed chosen last November. We can See where we are today, in the middle of Spring, Dreaming for the Seed of a new Harvest. This Time and Place was a choice we made last Fall. Did I even mark which Seeds we planted? A visit back to October and November will help us remember, our last life-changing Truth. Our candles burn for Don Alejandro, reflecting the Light he shared with us. May we send the Grandfather Tata, our Love and Light. Don Alejandro is bed-ridden at 90 and we’re holding watch. A contact email for a dsonation to help cover his medical care is included in the Update on Don Alejandro’s health shared by his dear friend Joseph. UPDATE: March 2, 2019 Video message of gratitude from Don Alejandro. Cherokee, Heron/GUWI’SGUWI: Sign of movement, of perpetual motion, recycling, regeneration; environmentalists fighting for the underdog. Heron is mentally alert, rational, yet opinionated; has a great faith in people and in the divine plan, holding the magic of ministry, medicine, marketing and matchmaking; healing abilities, especially with crystals; negotiation and mediation energy. Heron is symbolized by Deneb, located in the Northern Cross beside the Milky Way. Wisdom/CIB represents the Old Ones, the Ascended Masters of Divine Consciousness. This is a Day to Honor the Wisdom that has gone before. The Serpent/CHICCHAN trecena has been preparing us for the Quickening of Spirit, the Knowing of our Divine Gifts of Consciousness. We’ve been inspired to see that the Power of the Gifts require a mind of Divine Consciousness. Our own Application of Wisdom will maintain the Integrity of the Gifts we will Know. In the 6th uinal, our movement toward a Major Life Change and the New Generation of our Self, is no longer a mystery. We have the Momentum for Knowing. Tone 12 holds the Intention of Understanding. We put the pieces together that defined the Inspiration of CHICCHAN… to Know our Self, to Know the Truth. All the Reasons for Life’s experiences can be drawn to the Heart by Wisdom/CIB. This is marked as a Day to Honor the Ancestors and the Sacred Wisdom they preserved as our Inheritance. We are crossing a threshold at our own Maturity. Our thoughts will be Divinely turned to the same thing. Through an application of every thing we’ve learned, we’ll imagine the Best of our Self that we would create as the next generation of our Self. We consider the Wisdom of Spirit that could be our gift to the Future. The way to Honor the Elders, is to Listen and Follow. Wisdom/CIB always shows up when the student is ready to learn. There is a Divine Time and Place for every Truth of Wisdom. Tone 12 offers the Gift of Retrospection. CIB will show us how our past can create our Future. Tone 8 is the Zenith Hour, the Holy Day that begins the Transformation of each trecena. Tone 8 represents the Justice of Harmony and Equity. The Creator’s Holy Provision for Human is the Balance of Divine Justice. 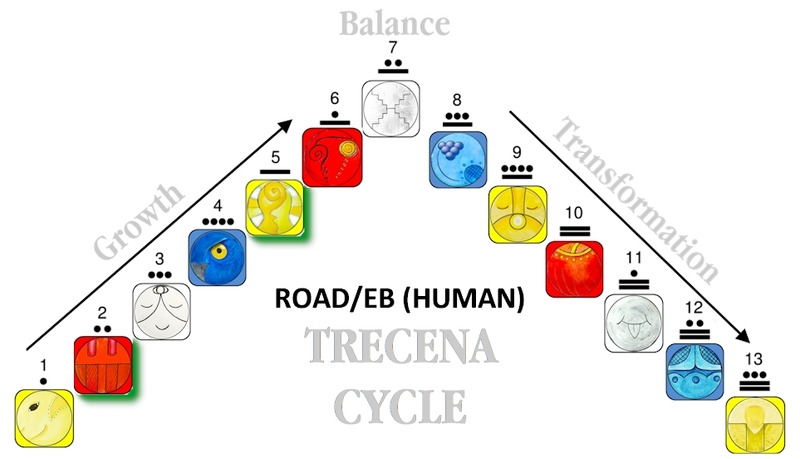 Road/EB is the Day Sign of Human and the Road of Human’s Destiny. We were seeded on Mother Earth as the Personification of the Creator’s Love to Multiply to Abundance. Our Beginning and End was designed from the beginning so Human would personify the Vibrations of Love and Happiness. Through Human’s expression of Love, the Creator could witness a material illustration of its own Love. Our Highest Aspiration is to demonstrate what Love looks like and Feels like, through Human’s Relationships with one another and with the Natural World. These are Human’s Spiritual Tools of Art. When we are carrying out an Intention for the Sake of Love, we are Living Illustrations of Love. We are the Object of the Creator’s Affection. Road/EB is also known as Human. EB represents the Calendar of Human, the Tzolk’in that marks our Destiny. The glyph illustrates the Road of Destiny on Human’s head. Our Destiny is a matter of the Choices we make. Serpent/CHICCHAN inspires our Consciousness to Know our Divine Path is Seeded in our Mind. Altar to 13 N’oj (Earth/CABAN) in Guatemala, near Lake Atitlan. I found the image online. Jen identified it as one of the Year Bearer altars and a place her Elder had guided her to bring an Offering to Honor Human “Knowing” on Mother Earth. HOLY DAY OBSERVANCE: 8 Road/EB is observed as the Holy Day for the Celebration of Human’s Divine Destiny. Known as the Sac’be, the “White Way” is the path of Light, marked as the Sacred Calendar of Human. The CHICCHAN trecena leads to the Ascension of 13 Earth/CABAN, the Consciousness of Human’s Divine Authority on Earth and Belief in the Promise of Divine Justice. A past planetary Ascension cycle led by 13 Earth/CABAN was a turning point of change that was initiated 03/06/1960. In the 7 years that moved us toward that cycle’s 7 Road/EB Year, Human created “the Summer of Love. The last planetary ascension cycles (13 Earth/CABAN) was initiated 02/22/2012. So have we seen the chaos of planetary change. This is the First 7 Road/EB Year, measuring a Balance for Divine Justice since the ending of the Long Count on December 21, 2012. The calendar reflects the synchronicity of Time and Place. We can create a New Summer of Love from the Choices we make at This Time for a New Beginning. Peak Tone 7 holds the Intention of Balance. From the top of the pyramid, we can see all that Is and all that is Not. Tone 7 is the Reflection that holds the Great Law of Creation, “As Above, So Below.” What is created in one realm, is balanced in all others. Monkey/CHUEN is a Creator. CHUEN is the Weaver of TIme. The glyph illustrates ALL time, rolled up on the head of the Monkey. Monkey/CHUEN is a creature of curiosity and play. CHUEN is attracted to Unknown Beauty. Monkey sees the Beauty of form, function, meaning and purpose. The Monkey is attracted to one thing, and then another… known to rarely finish anything. Monkey is the Divine Demonstration of a Creator. Just as Love Begets Love, so does Creation Beget Creation. Anytime we create something, we end up with a new idea on how it could be better. Or, we think it’s already perfect, and we should create so many we’d never finish. We Have the Spiritual Gift of always moving toward a Higher Creation. The Monkey isn’t bound to finish what it started when it sees something more beautiful. This is how we will be drawn into our own Highest Creation of Beauty. Every little creation leads to our Most Divine Creation. Every Creation will turn us to another creation, until we arrive at a perpetual Creation of Love.